Client certificate wizard - Find out wich client certificate suits you! We have a large selection of client certificates displayed in our comparison chart. WHAT USE FOR YOUR CERTIFICATE? Select the main function you'd like your certificate to do. Indeed, some certificates can fulfill several of the tasks listed here. French (and European) legislation about dematerialized documents and their digital signature is extremely severe. 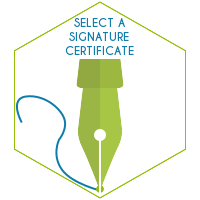 To be legaly recognized, a signature has to respond to several criteria. Otherwise, your documents couldn't be used in any legal procedure. How many e-mail addresses do you need to secure? This question has to seriously be taken into account when building your choice. If your documents are to be read by an external public it is preferable to select a certificate natively recognized by Adobe. It is not the case for internal documents.